Blog posts and articles about aviation, and more specifically my interest in aviation through the use of flight simulators. To improve the sense of immersion in my home flight simulator, I purchased and installed a Buttkicker Gamer 2 transducer. 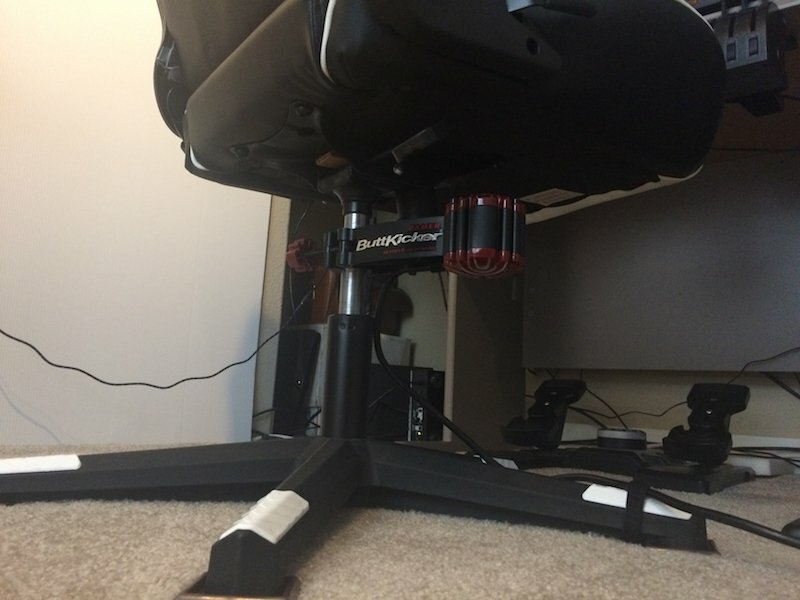 This is a device that bolts to the base of an office chair and transmits vibrations into the chair based on sounds generated by the flight simulator. It’s like a subwoofer with vibration only, no sound. I purchased the Buttkicker from FullCompass.com, with free shipping, and it left their warehouse the day after I ordered it. Many other vendors I researched were either out of stock or sold them at above MSRP (Amazon, what the hell?) The Gamer 2 edition comes with the transducer, a dedicated power amplifier, and all the cables you need to connect it to your flight simulator. Installation took about a half hour, and most of that time was spent feeding the wires around and out of the way behind my simulator. After getting it plugged into the sound-out jack on the back of my PC, I fired it up and tested it out. It really startled me the first time it vibrated my seat. Even though I knew it was going to happen, the amount of vibration it can produce was startling. I reduced the sound levels and did some more testing. From all I’d read on the forums, I learned that although the Buttkicker can be used directly with X-Plane 11, the experience isn’t as specific as it can be. The solution is a pair of software solutions working in tandem, one free and one payware. Simshaker for Aviators is the free part, and Simshaker Sound Module is the payware part (about $30 USD; it’s from a guy named Andre in Vologograd, Russia, so the exchange rate will vary). Using these two apps, you can fine-tune the types of simulated events that produce vibrations and the amount of relative vibration for each event. Otherwise, without these apps, it vibrates generically with any low-frequency sound. My flight simulator is located in a spare bedroom on the second floor of my house. There was some noticeable vibration in the room on the first floor. This was because the Buttkicker was attached to my office chair, which was sitting on its wheels pressed into the carpeted floor directly above. 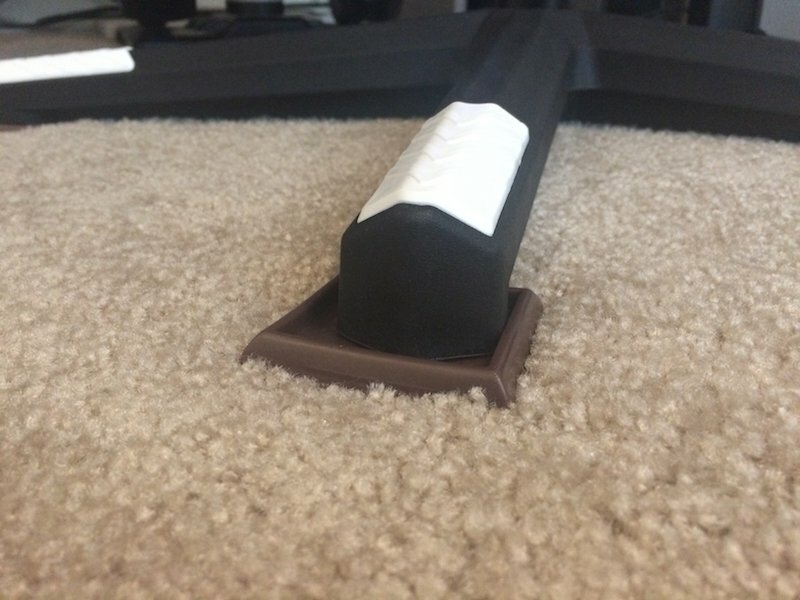 I needed some way to reduce or eliminate the vibrations being transmitted through the floor. I ordered some sorbothane anti-vibration isolation pads from Amazon. 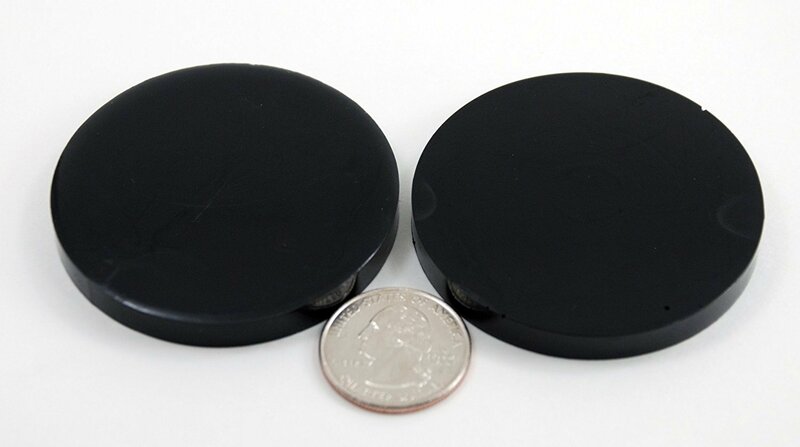 They are 2.25″ wide and about 1/4″ thick. I opened the package and let them air out overnight in the garage as they have an off-putting smell when you first open them. 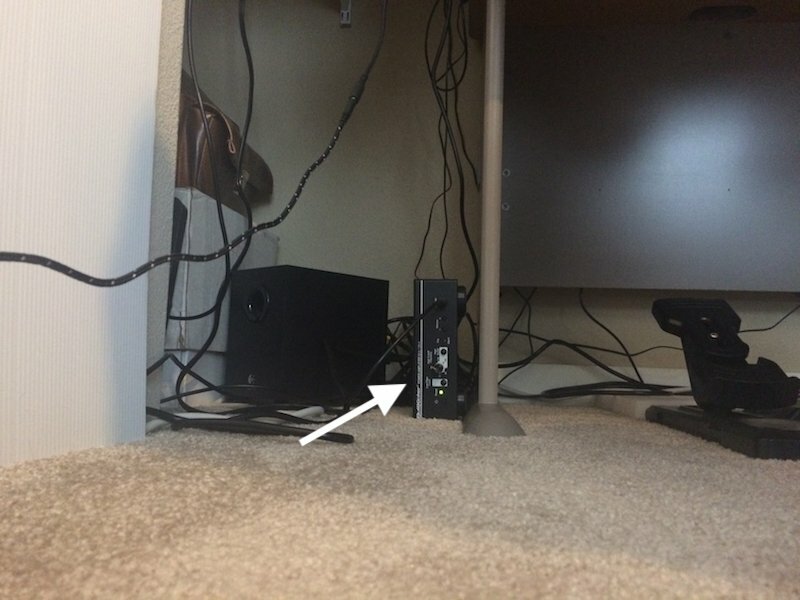 This reduced the amount of vibration being transmitted into the room below by at least half. It was quieter than the noises generated by my forced air furnace. Once I got all that set up and got the software installed, it was time for some test flying. I started in Boston and flew to Nantucket, then over to Martha’s Vineyard. The Buttkicker conveys a predictable engine vibration, along with other events like flaps going up or down. The most exciting vibration event is when the wheels first touch down while landing. I still have a lot of experimentation to do, both with the amplifier settings and with the software settings. So far I would say it was a worthwhile investment for those wishing to increase the level of apparent immersion in their home flight simulator. X-Plane comes with a Cessna 172 by default. It’s a competent plane and it is what I have flown since I got X-Plane 11 back in May of 2017. I wanted more realism so I purchased the after-market Cessna 172 by Airfoil Labs. It was buggy and presented several challenges to flying. I had to learn how to land all over again. There were several graphical issues that prevented me from flying the AFL 172 at all. I got fed up and uninstalled it. After reading posts from other sim pilots on X-Plane.org’s forum, I discovered another approach. Now, I fly the default Cessna 172 with the SimCoders.com Reality Expansion Pack ($19.99) installed on top of it. The aircraft experience feels more immersive, because I’m not just flying a virtual plane, I’m managing the entire aircraft from when I approach it on the tarmac to take-off to flight to landing and finally when I park it. I even conduct maintenance on it like I would a real airplane. The REP has been very stable, too. There was one sound error that occurred, but removing the Cessna 172 from the list of possible AI aircraft fixed the problem. So far, I’m very impressed with this approach. I’ve spent several hours practicing pattern work, but I’ve always done it with clear weather and no wind. Lately, I’ve attempted to add crosswinds to the mix to simulate more real-world conditions. It hasn’t gone well. I set up a 6 kt 90 degree crosswind at Aurora Muni (KUAO) and took off in the X-Plane default Cessna 172. Take-off and flying the left-hand pattern went relatively well, but when I came in on final and entered the glideslope, things seemed to get wonky. My approach was made on runway 35 so the wind should have been directly from my left. The windsock showed this to be true. However, my plane seemed to be drifting to the left. I attempted a forward slip with a little right aileron and a small amount of left rudder, and things went wonky even more. It was crazy trying to get the plane lined up with the runway, yet the wind was only 6 knots, with no gusts configured. I gunned the engine, raised my flaps, and conducted a go-around. As I was flying the pattern again, I paid close attention to what the wind seemed to be doing to the aircraft. At pattern altitude of 1,000 feet AGL, it seemed to be getting blown to the west. That’s incorrect — the wind was configured to be blowing from the west. I turned onto the base leg and the groundspeed slowed, again indicating I had a headwind from the east. When I turned onto the final leg, once again I had fits getting a line on the runway. I’ve heard that X-Plane 11 has notoriously inaccurate ground effect winds and handling. This seems to be the case. When I got my wheels on the ground, I turned my ailerons fully to the left, to the west and the direction the windsock indicated the wind was blowing, and got shot far to the right and onto the grass. I can’t confirm it, but it very much acted like the wind was blowing the exact opposite direction the windsock was indicating (and the weather configuration specified). UPDATE 01-29-2018: I have confirmed the wind and windsock are behaving correctly in X-Plane. It’s operator error on my part. Back in June, 2012 I rode my 2007 Suzuki V-Strom 650 to Colorado and back, a loop trip of 5,000+ miles over 15 riding days, passing through 10 states. [You can read my riding blog here.] 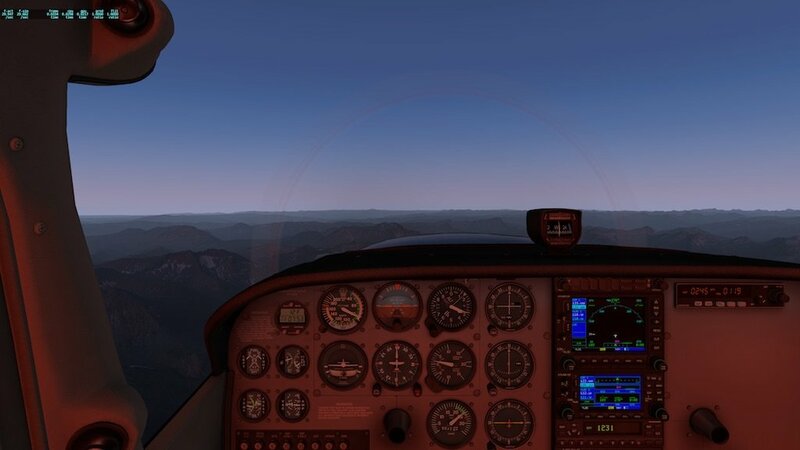 Once I began learning to fly in my home flight simulator, it became my goal to simulate that trip as closely as possible in a virtual Cessna 172. The trip in my flight simulator has been ongoing since late June and is nearly complete. I only have one leg remaining. My plane is currently parked at Grant County Regional Field [KGCD] in John Day, Oregon, with my final destination of Troutdale, Oregon. Throughout this trip, I have attempted to mimic the actual route I rode on my motorcycle as closely as possible, following primary waypoints at major junctions. I have also landed at the nearest airport to the places where I stopped each day for lunch. This means that each day’s simulated leg entailed at least two take-offs and two landings. 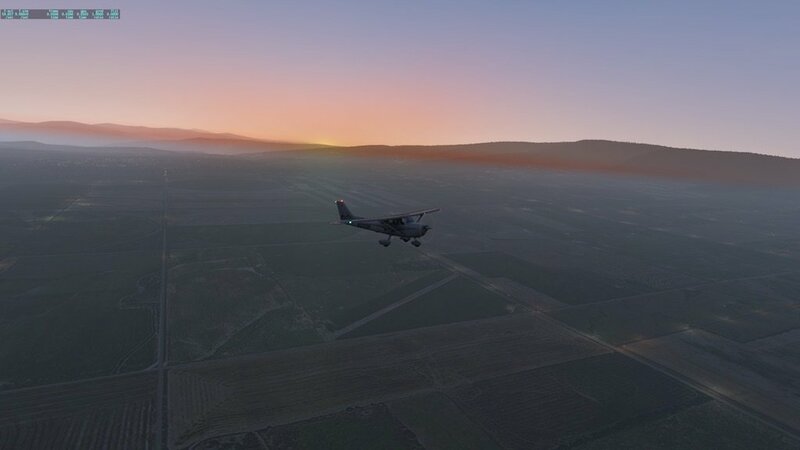 Recently, I experimented with early morning take-offs to see what lighting conditions look like in X-Plane 11. The results are amazing, but I noticed that in cities with custom scenery (Ortho4XP), the lights are nearly non-existent. Only stock scenery has the great lighting effects. I flew from Red Lodge, Montana up and over Beartooth Pass and across Yellowstone Park to land for my mid-day stop at West Yellowstone. I took a screenshot of my cockpit. I landed at Butte, Montana. The following day, I took off from Butte and flew to Grangeville, Idaho. I simulated real-world weather conditions and barely survived the landing. I had a constant cross-wind of 12 knots with gusts up to 21 knots. This shot me diagonally across the runway, coming to a stop on the adjacent taxiway. Suddenly a gust of over 60 knots hit my plane broadside and flipped it into the air and over onto its top. It’s my only crash of the entire trip so far. The take-off from Grangeville the next morning was stunning. I left a few minutes before sunrise and the scenery and lighting was very life-like. From there, I mimicked my bike route to Oxbow, Oregon along the Snake River at Hells Canyon, then over to Baker City where I landed for lunch. The day ended at John Day, Oregon. This trip has been an excellent learning experience. The airstrips and airports have been diverse. Flying in Colorado was a special challenge because of the high elevation airstrips and numerous 14,000+ mountain passes. Some take-offs required circling like a bird to gain enough altitude to move forward. Back in 2012 I took a solo motorcycle trip from Oregon to Colorado that spanned 10 different states in 16 days (Oregon, California, Nevada, Arizona, Colorado, Wyoming, South Dakota, Wyoming (again), Montana, Idaho, and back to Oregon). One of my goals after setting up my flight simulator was to take that same trip virtually in a Cessna 172. I began that virtual trip a few weeks ago and am currently parked at an airstrip in Durango, Colorado. I have mapped the trip to include takeoffs and landings at the same towns where I had overnight stays on my original motorcycle trip, and I even have landings and takeoffs in towns where I stopped for lunch. I’m trying to mimic the same route as realistically as possible, just in the transportation medium of flight. One of the aspects of this trip I have implemented is detailed flight logs. I started by making notes in a spiral notebook as I flew, writing down flight date, departure airport, destination airport, and a few minor details along the way such as waypoints and altitude. I refined those notes to include more detail, then decided to use a formal flight log form that I fill out for each flight. 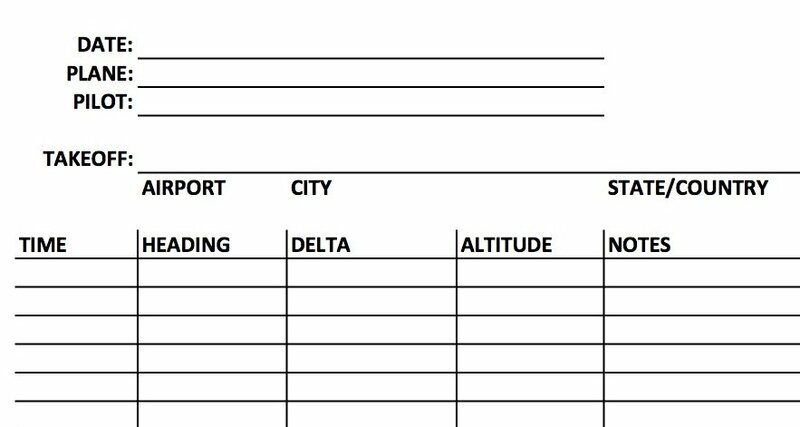 I used a spreadsheet to create a printable form that I put on a clipboard and fill out as I fly. I make notes every time I change course or altitude, with timestamps. About the only thing I don’t write down is my airspeed. So far the logs have worked great, and I have really enjoyed the detail-oriented aspect of the process. Flying, once you’re at cruising altitude, can be somewhat boring, especially if you use autopilot. Making notes as you fly keeps your brain occupied, and gives you a reason to pay attention to your gauges and the other aspects of the flight, rather than just zoning out and getting bored. You may download a printable PDF version of the logbook here. The original Excel spreadsheet is available here [XLSX]. The Delta column is for denoting changes in altitude or bearing. I often use < or > to show changes in course for left or right, respectively, and up or down arrows with X fps or -X fps to show changes in altitude. For Altitude, I write the altitude I was at when I began the delta.